Want to look your best, have your clothes fit better and lower your risk of back pain? 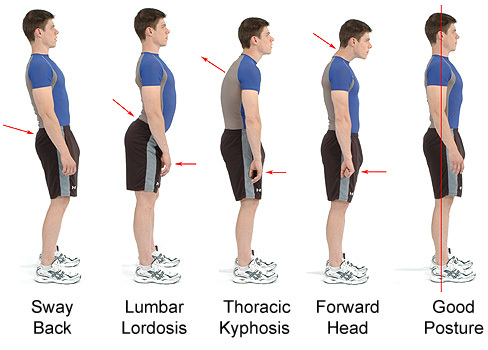 Correct your posture. Because of the physical layout of our daily task tools (computers, cars, desks, etc. ), most of us settle somewhere between the third and fourth picture to the left. That contributes to back fatigue and pain, increased risk of injury, reduced air flow (and often listlessness related to lower oxygen intake), and can even adversely affect digestion. But it’s easy to fix. There’s a longer term root cause correction, and an immediate adjustment, both of which work together to improve the situation instantly and keep it corrected going forward. The longer term solution is to strength train (weights, machines, bands or body weight) to create balance throughout the upper body. Most important is to equalize the strength within a reasonable range between the pulling muscles (upper back, rear shoulders and biceps) and the pushing muscles (chest, triceps and rear shoulders). I’ll go into more detail on that in the next blog. Here’s the quick fix: Whether you’re sitting, standing or walking, pull your chin in and the top of your skull up, maximizing the space between your ear lobes and your shoulders. It’s also helpful to engage your abdomen, as if you expect someone to flick your belly lightly with the back of their hand. That’s it! This correction will put your spine into a neutral curvature and open up your torso so you can get deeper, fuller breaths while at the same time stabilizing your spine. How can you remember to do this throughout the day? Notice other people’s posture and use your observations as a trigger to correct your own. And you’ll be providing a great silent example for other to emulate as well! This entry was posted in Healthy Habits and tagged pleasanton personal training, pleasanton small group fitness. Bookmark the permalink.